Have you decided to go on a road trip in Sicily ? Excellent choice of destination! Visiting Sicily by car is the best way to optimize time on site and miss any of the must-sees of this beautiful island. No waste of time in public transport and the freedom to choose where and when to stop , it does not refuse! In order to help you organize your trip , I have prepared 5 road trip itineraries according to the duration of your stay in Sicily (1 week, 10 days, 2 weeks, 3 weeks) and your arrival airport. 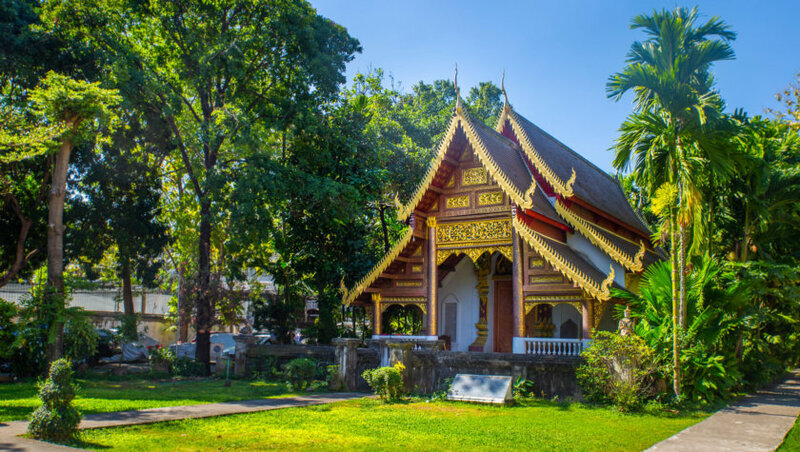 At the end of the article, I also give you some tips to know the best time to leave and the budget to provide for your stay. Which airport to choose to start a road trip in Sicily? When to go on road trip to Sicily? The 2 main airports where you can land in Sicily are those of Palermo and Catania . They are very well served from France, Switzerland or Belgium and the rates are more or less equivalent . Your arrival airport will therefore depend on the part of Sicily that you want to visit. It is therefore better to privilege Catania for a stay in the East and Palermo , if you want to visit the West. To know: that there are also 2 other smaller airports in Trapani and Comiso . But their location makes it not necessarily the ideal to start a road trip in Sicily. Who says road trip, necessarily says car rental! The easiest way is to rent your car in Sicily directly at the airport. This is where you will have the most choice at the level of the renters and the rates are more advantageous than if you rent your car in an agency in town. Compare directly and easily all prices of car rental companies. Very practical to save money but also know the opinions of the old customers on the renter. To benefit from the complete protection insurance which insures you to be refunded in case of theft, accidents or even small scratches. And in Sicily, it is not to neglect. They offer the guarantee of the best price: If you find cheaper elsewhere, they refund you the difference. If you want to do a Road Trip of 5 days or less in Sicily, I recommend you read my article: Visit Sicily in 1, 2 or 3 days – the best routes. I will explain all the necessary to easily organize your short stay on the island according to your arrival airport! We begin serious things with this first circuit by car. Here, I suggest an example of a road trip from Cataniato visit the east of the island by car for a week. On this 7-day road trip to Sicily: Catania, Syracuse , Ortigia Island and Taormina . Day 1: Depending on your arrival time in Catania, you can start your holiday by taking a short walk to discover the largest city of this part of Sicily. I advise you to start with the Piazza del Duomo , which, like everywhere in Italy , constitutes the historic heart. You can admire the elephant fountain , the palazzo municipio and of course the Duomo of Catania or St. Agatha Cathedral . Then continue along the 2 main arteries: Via Etnea and Via Crociferi . 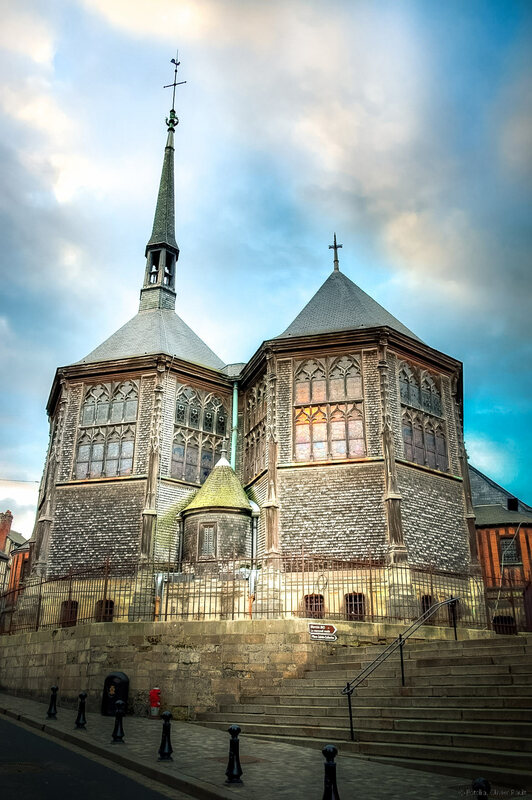 There you will find shops, cafes as well as the monastery of Saint Nicolas the Arena and some churches. Continue your road trip in Eastern Sicily the next day, leaving for Syracuse and Ortygia , 1 hour drive from Catania. You can plan to spend 3 nights there. On the third day , in the morning, I recommend taking a walk along the Syracuse bike path (departure from the piazza dei cappuccini). You will be so close to the archaeological park of Néapolis , your activity of the afternoon! Do not miss the Roman amphitheater , the Greek theater or the famous Ear of Denys. 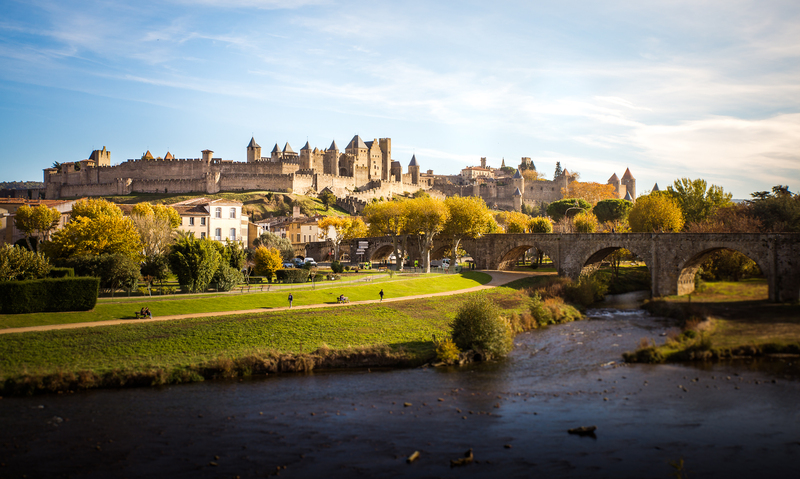 For your 4th day , take your car to tour the Baroque cities , south of Syracuse. UNESCO World Heritage Site, the visit of Noto, Ragusa and Modica is a must for a roadtrip in Sicily! You can find many more things to see in our Syracuse article: What to do and see in Syracuse? The last leg of this week-long road trip to Sicily takes you to Taormina for 3 nights . It is a 1-hour drivefrom Taormina to Syracuse. The via circumvallazione and its stairs rising on the heights. 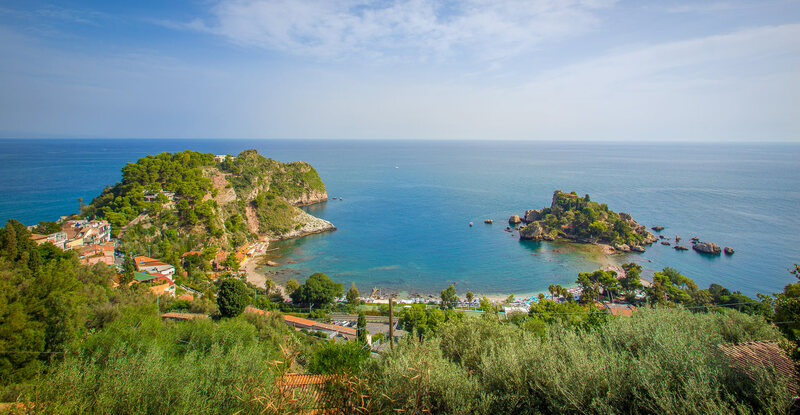 And finally, get off at Isola Bella , the beautiful beach of Taormina. Day 6: As a road trip in Sicily of 1 week would not be complete without the visit of Etna, this is what I advise you to do for your second day in the city. As you visit Sicily by car, you can choose to go directly there. But if you do not want to bother with the parking or other, you can On the program of this 10-day road trip to Sicilyalso book an excursion organized from Taormina. Amenities, transportation, guide are included, which is really convenient. Day 7: For the last day of your 7-day car tour , visit one of the most beautiful villages in Sicily: Castelmola . Only 5 km from Taormina, it has a beautiful castle in ruins and offers beautiful views of Mount Etna and the valley below. 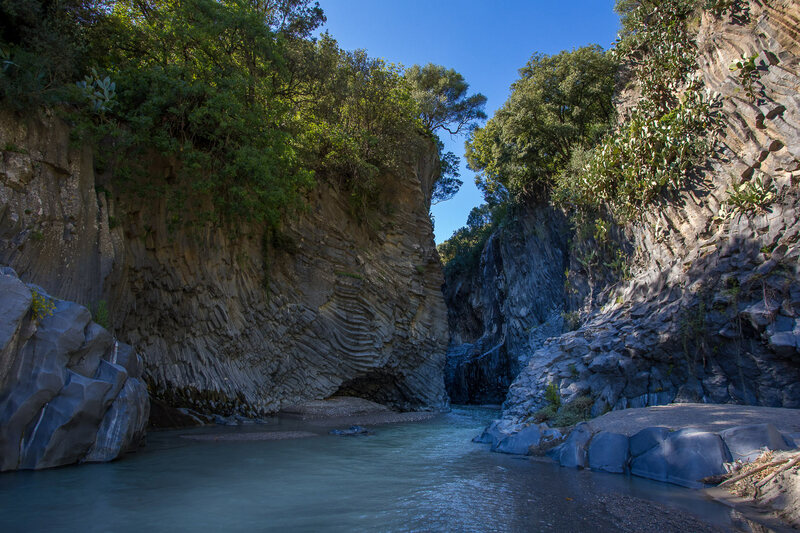 Then go for a walk in the gorges of the Alcantara , 50 minutes from Taormina. This narrow canyon was formed as a result of several lava flows, which on cooling created improbable rock formations. At the end of the day, return to Taormina for a last night in Sicily. If you would like to have a more detailed version of this weeklong road trip to the East of Sicily , I invite you to read this article: Itinerary of a week in Sicily. Very practical, you will find in addition all our tips + where to sleep at each stage. It’s the best way to prepare your trip easily! For this second example, I suggest you make a road trip from Palermo to visit the West of Sicily by car in 10 days. Day 1: After picking up your rental car, join Palermo to start discovering the city. 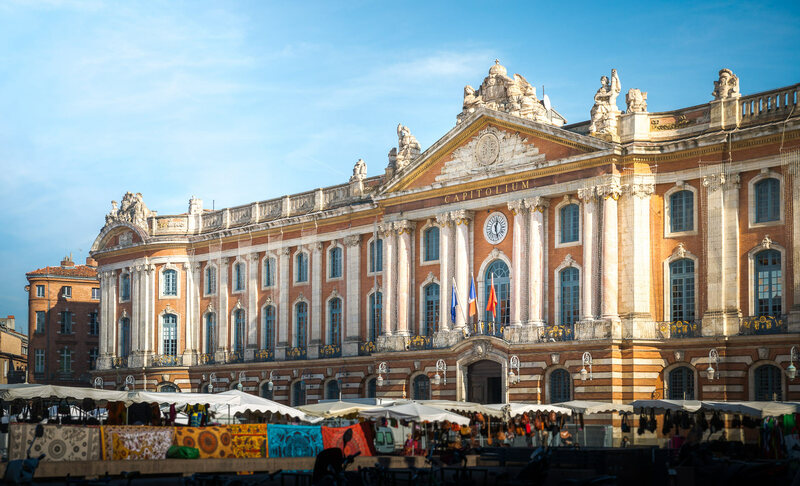 For your 2nd day , continue your visit with a trip to the Ballaro market, a visit to the Abatellis palace and awalk on the Fioro Italico . You can then take a break in the botanical garden or gardens of Villa Giulia . You can also visit the catacombs and finish the day by visiting Monreale, a 30-minute drive from Palermo to visit the famous cathedral. To best organize your visit to Palermo, do not hesitate to consult our article: the 15 things to do in Palermo. For the 4th day , I recommend you get up early and go to visit the valley of the temples of Agrigento, a must in the region. Then drive back to the historic center of Agrigento for a short walk of about 1 hour to discover the monuments of the city. 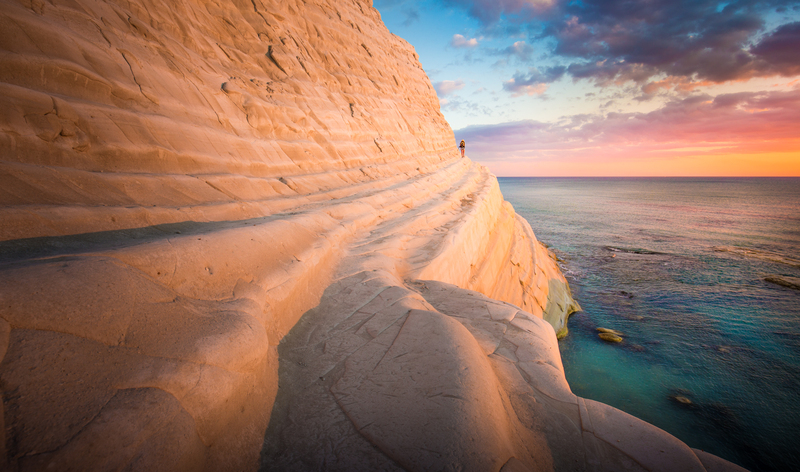 Finish the day by visiting the Scala dei Turchi , a beautiful place for swimming. It is the ideal place to admire one of the most beautiful sunsets of all Sicily! Today (5th day) your road trip to the West of Sicily, takes you to Selinonte . On the route between Agrigento and Selinunte, you can stop at the beach of Heraclea Minoa and visit the beautiful city ofSciacca . The afternoon program will be reserved for visiting the Archaeological Park of Selinunte. 6th day: The next day, direction Trapani to spend 2 nights. On the way, you can make a stop in Marsala to taste the wine of the same name and then continue on the SP21 road at the exit of the city. This will allow you to go through the salt road , which crosses the salt marshes between Paceco and Trapani . The opportunity to admire beautiful landscapes. 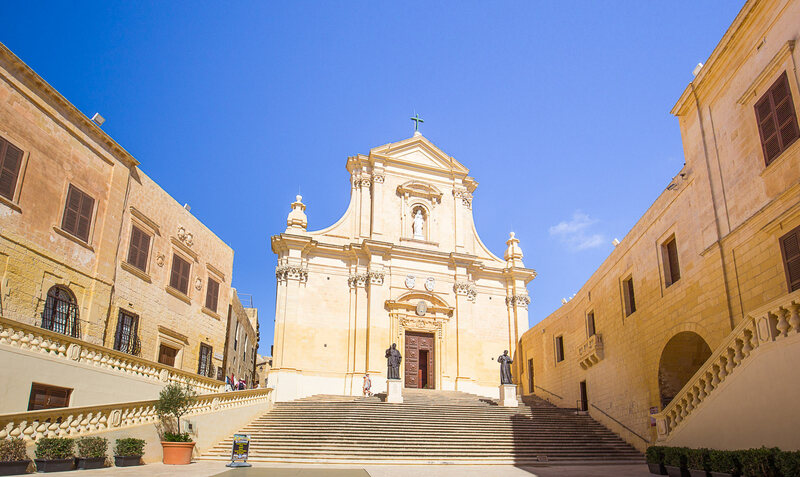 In Trapani, take a stroll in the historic center on Via Garibaldi or Corso Italia. Then, for the afternoon, climb to the medieval village of Erice , accessible by cable car or car from Trapani. The 2 solutions offer beautiful panoramas, to you to choose what you prefer! 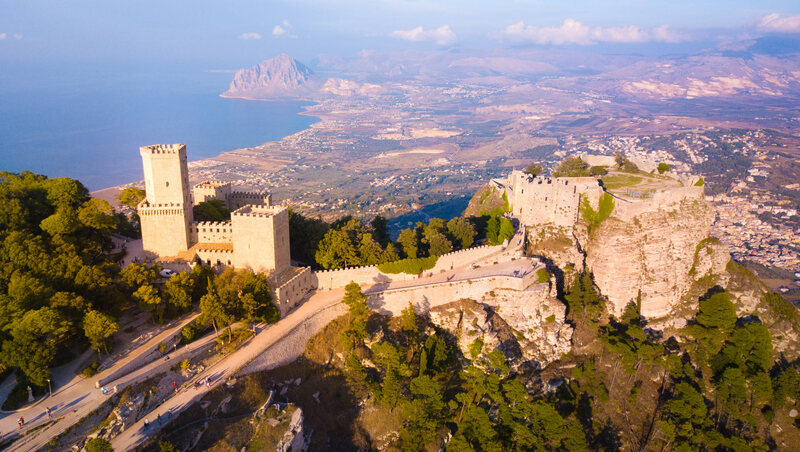 In Erice you can stroll along the cobblestone streets and reach the castle to enjoy views of Trapani and the sea. Day 7: For the second day in Trapani , I recommend a trip to the Egadi Islands , accessible by ferry from the port. That of Favignana is the closest, you can also make the tour in 1 day by bike (the best way to visit). Plan stop swimming in the creeks! For this 8th day of road trip around Western Sicily, direction Scopello, to spend 2 days in the surroundings (50 minutes drive from Trapani). 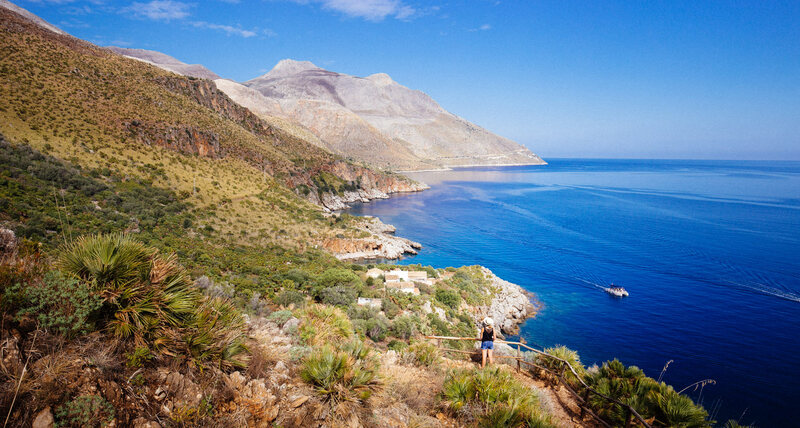 Scopello is the ideal base for visiting the Zingaro Nature Reserve , one of the most famous on the island. From the South entrance and after having paid the entrance at 5 €, you can walk along a path that runs along the sea and gives access to several coves below. The opportunity to alternate hiking and swimming. The round trip takes about 4 hours but you can spend the day there if you swim. There are also 2 other beaches to test in Scopello: the beach of Guidaloca and that of Tonnara. The next day (9th day) , I recommend a walk around San Vito Lo Capo , 55 minutes by car. The road before reaching San Vito is superb and you can stop to swim in small coves. If you prefer large sandy beaches, push to the city, you will find your happiness. Then join the natural reserve of Mount Cofano , for another walk by the sea. In the same style as the Zingaro, but with landscapes all the same different, the walk is super nice. Day 10: to conclude this road trip in Sicily and finish the loop started from Palermo, join Castellamare del Golfo. Only 35 minutes from Palermo airport, it is the perfect city to finish the holidays. But before, you have one last site not to be missed: the Temple of Segesta . Perched on a hill, it offers a beautiful view of the surroundings. You can end the day in Castellamare with a stroll in the center and a swim. Good news if you have 15 days for your road trip , you will be able to go around Sicily , from East to West! The 2 week road trip to Sicily that I propose is from Catania. It combines the other 2 circuits by car that I told you just above, with some small adjustments to optimize travel. First day: arrival in Catania and visit of the historic center. Start from the Piazza del Duomo and the cathedral, take the Via Etnea to Piazza dell Universita and the 2 palaces there. Stroll through the gardens of Villa Bellini and end your tour with Via Crociferi and its many churches. The next day (2nd day) , I advise you to take a trip to Etna . From Catania, agencies offer to take you there directly. Transportation, guide and equipment are included. Following this two-week road trip to Sicily will take you to Syracuse and Ortygia Island for the next 2 days. Day 3: Spend the first day in Ortygia to see the Piazza del Duomo, the temple of Apollo, the port. Continue by the Manicace Castello and admire the sunset towards the Aretusa Fountain. Your 4th day in Sicily , will be dedicated to the “modern” part of Syracuse . In the morning, take a walkalong the bike path from Piazza dei Cappuccini . In the afternoon, visit the archaeological park of Néapolis to admire the Roman amphitheater, the Greek theater and the ear of Denys. For the 5th day of this tour of Sicily by car in 15 days, spend the day discovering the 3 Baroque citiesclassified as World Heritage by UNESCO such as Noto, Modica and Ragusa. 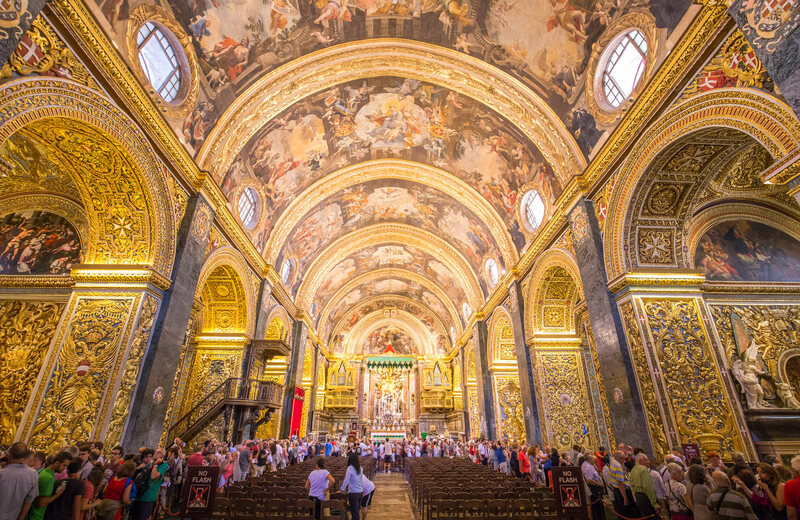 Between travel times and visits, plan a full day and sleep in Ragusa. Today (6th day) , I take you to visit the famous valley of the temples of Agrigento , 2 hours from Ragusa. 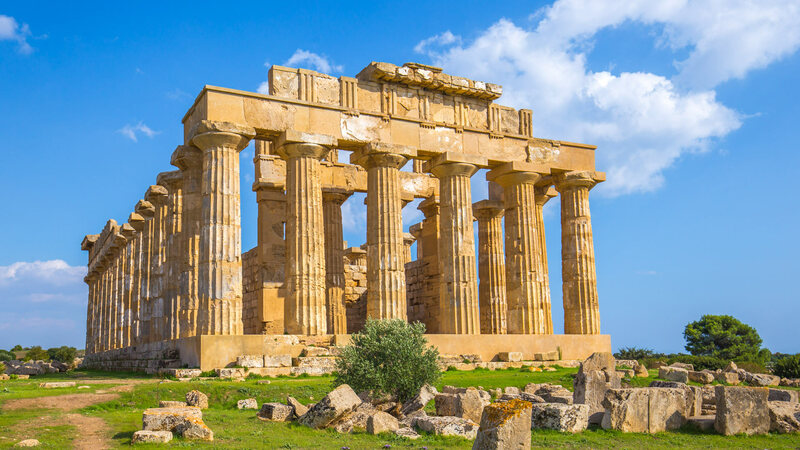 You can admire the 8 temples of this renowned archaeological site of Sicily. Not far from here, you can go for a walk in the historic center of Agrigento then finish the day by going to the Scala dei Turchi , one of the most beautiful natural landscapes of Sicily. For the 7th day of your vacation, you will go to Selinunte . On the road, do not miss the beach of Heraclea Minoa for the swimming break and the city of Sciacca to do some sightseeing. Arrived at Selinunte, spend your afternoon to browse the archaeological park to see remains of temples. The next day (8th day) , join Trapani for 2 days . On the way, stop at Marsala for a tasting of the wine of the same name then passage by the salt road (the SP21). Between Paceco and Trapani, it will allow you to passmany salt marshes and enjoy beautiful landscapes. After a walk in the historic center of Trapani , I advise you to reach the perched village of Erice. You can choose to ride the cable car from the city or drive there. In Erice you will find a medieval castle and ramparts offering a panoramic view of the surrounding area. 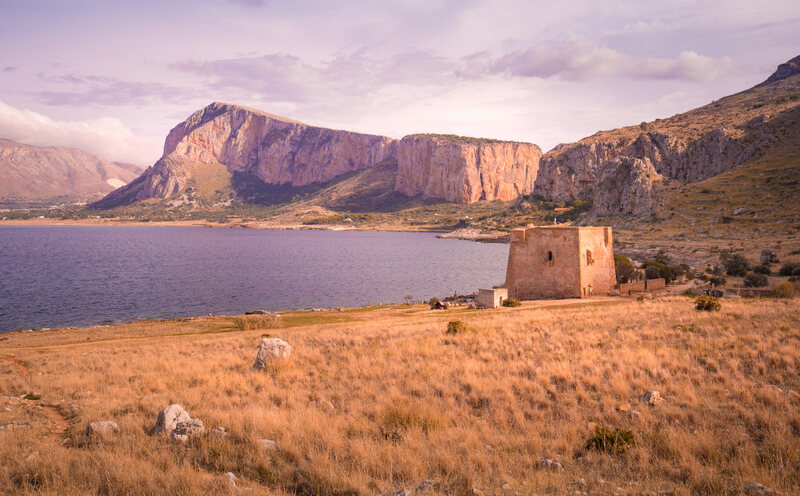 On the 9th day of your road trip in Sicily, go to the nearest islands of Trapani: the Egadi Islands . Every day, ferries make it possible to rally them from the harbor and in particular the island of Favignana , the least distant. To visit it, the best way is to rent a bike on arrival and go around during the day , taking breaks swimming in the coves. Day 11: Continue your 15-day Sicilian road trip through Scopello and especially the Zingaro Nature Reserve . Take the hike that connects the 2 entrances of the reserve, from South to North and return to your starting point. And do not forget to enjoy the pretty coves that you will come across on your way! For your last stop (12th day) , I invite you to join Palermo for the next 2 days and to discover its historical buildings. Day 13: After your first night in Palermo, go and see the Ballaro market to soak up the Sicilian flavors and atmosphere. Then you can visit the Massimo Theater (one of the largest in Italy) or if you are passionate about history, the Regional Archaeological Museum of Sicily . You will find in particular the remains of the excavations carried out in Selinunte. 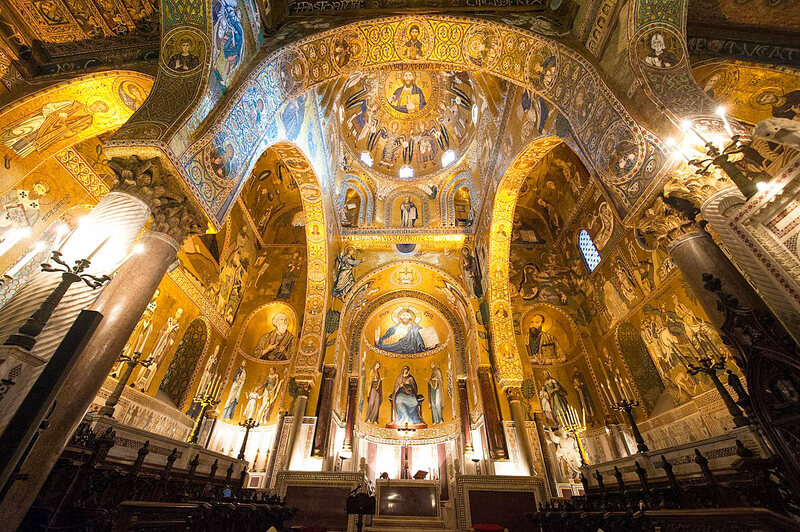 In the afternoon, head to Monreale by car to visit its cathedral, recognized throughout the world for its splendid mosaics gilded with fine gold. 14th day: For the last stage and the end of your road trip in Sicily, I propose you to go to Taormina. Take the road from the sea leaving Palermo so as not to miss the small town of Cefalu . Its bay is found on all the postcards of Sicily, so we should not leave without the souvenir photo! In Taormina , it is the historic center that is worth seeing. Go through Corso Umberto to reach Piazza IX Aprile . Then, climb the stairs to the Madonna della Rocca sanctuary to admire the panorama. 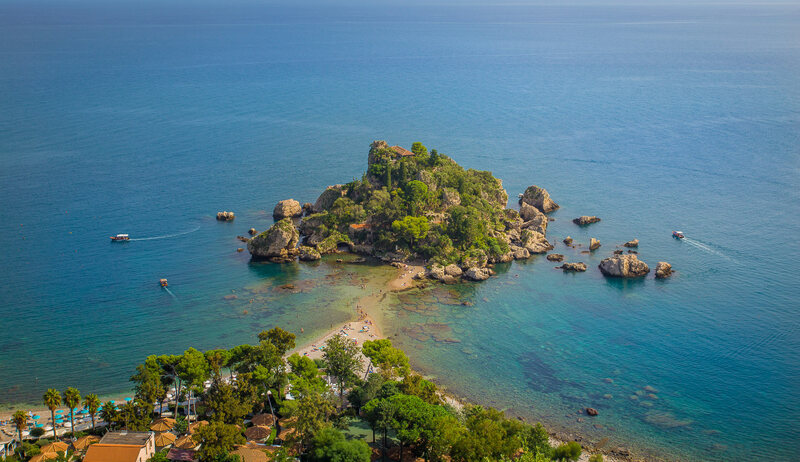 Go down to the gardens of Villa Comumale for a bit of freshness and finish the afternoon at the beach of Taormina: Isola Bella. At sunset, visit the Greek Theater. On the 15th and last day in Sicily, visit the small village of Castelmola, 5 km from Taormina. The panorama of Etna and the surrounding area is definitely worth a look! Then go to the Gorges de l’Alcantara. Carved by lava flows, the canyon offers amazing landscapes. If you have the chance to make a three-week road trip to Sicily , you will be able to have fun and take your time to complete the tour of the island. 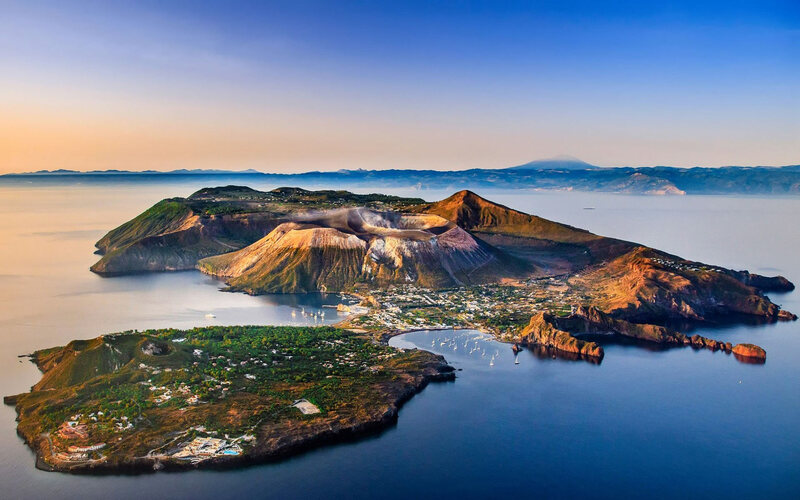 If you visit Sicily by car in 21 days, I advise you to resume our example of road trip of 15 days and add a few days to explore the Aeolian Islands. The first step is easy, you just have to resume the previous 15-day car tour . You can follow it to the Palermo stage. 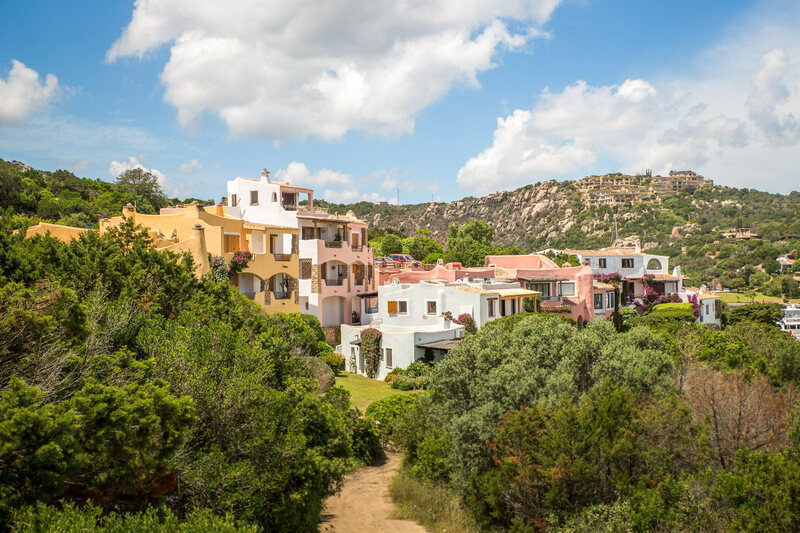 Then I advise you to spend 2 nights in Cefalù to discover one of the most photographed villages in Sicily and spend the other day at the Madonie Regional Natural Park. The other 5 days will be reserved for the Aeolian Islands situated in the North of Sicily. Starting from Milazzo, you can visit Vulcano, Stromboli or Panarea. After Etna, this is an opportunity to admire the other 2 famous volcanoes of Sicily. Finish the trip by 2 days in Taormina and its beautiful beach of Isola Bella, as in my 15 days tour. You can safely leave at any time of the year on a Sicilian road trip. Temperatures are generally mild, even in winter. There is no real “bad time” per se. After all depends on what you want to do and your interests. If you want to swim and sunbathe : the months of June, July, August, September and October are preferred. If you do not like the crowd , and you can afford to go off-season road trip : May-June and September-October are ideal. You can dive and enjoy the sights without the world. This is the best time for me to visit Sicily by car. If you prefer city tours and archeological sites , and that swimming is not scheduled, the other months of the year from November to April are perfect. Of course, you will not be safe from the cold or a few showers, but this is the case all over Europe at these times. On the other hand, pay attention to the snow which can invite you to the summit of Etna or Stromboli between December and February and thus to deprive you of the visit. To give you an idea of ​​what a road trip in Sicily can cost, I have prepared a table summarizing the costs for 2 people (based on our different trips to Sicily). The Sicilians do not respect the rules of the road at all, so be careful especially in roundabouts, traffic lights and priorities. Car hirers are professional hustlers in Sicily , so I repeat myself but be careful and go through rentalcars with full protection. On the other hand, gasoline costs quite a bit more than in France. It is therefore a cost item for a road trip. The roads are rather in good condition. Never leave, I mean, anything of value in your car or anything in sight. Flights are very common in Sicily. Even if you just take a 5 minute swim break, do not let anything hang around. Do not drive at night and if you can not do otherwise, fill up with fuel during the day. Do not stop at an area or at a service station at night. If I tell you all this, it is not for the purpose of scare you, but just to recommend you to pay a little attention. We never had any problems during our road trip to Sicily but it is true that we have been more attentive to our business than in other countries. For example, we generally preferred to leave our luggage at the hotel in the morning, even if it was a detour, than to keep them all day in the car. It is sure that sometimes, we could not do otherwise but at that moment nothing exceeded the trunk or we parked in guarded parking. Discover all our articles about Sicily: All Tips about Sicily are listed here.